Demetrius O’Shad Leysath, Bertin Estiven Hernandez, Trent Marks Miller, Aaron Montrice Cook, Ryan Heath Thurmond, Harrington Jamal Jackson, and Jacob Keaton Goforth. The best thing about this business is getting to meet really special people. As is the case throughout our society some of the really special people represent the best attributes of mankind and others the worse. Last week I had the opportunity to visit with some of the best and now look forward to many more opportunities to have the good feelings I experienced at the Strom Thurmond High School Library Wednesday morning. I had been getting numerous comments from within the education circles, that I frequent, that led me to believe there was another noteworthy element of the Strom Thurmond student body that I should tell the public about. I did. 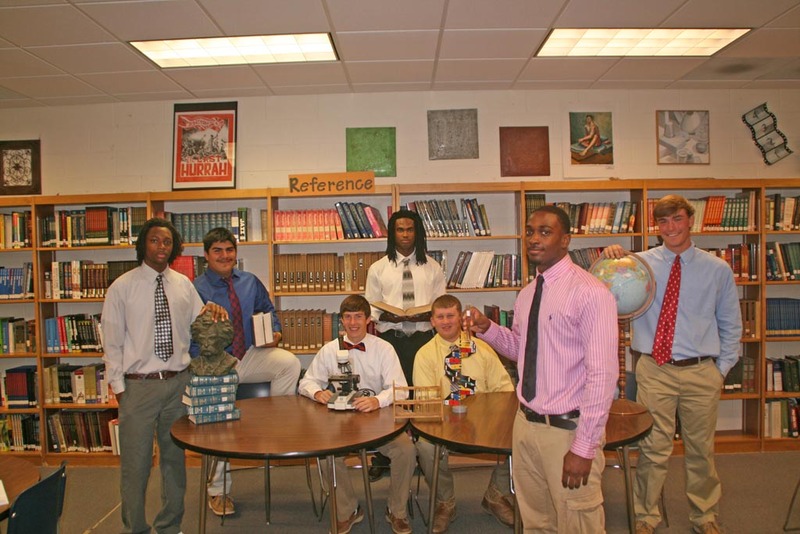 The 2012 Rebel Football Team’s seniors will include at least seven players in the top quartile of what will be the class of 2013 and I was there to meet all of them. I will go ahead and say this right now. “It was an absolute breath of fresh air getting to spend some quality time with these student athletes.” When I entered the library I was greeted by seven young men with smiles on their faces and a lot to say that was worth listening to. Demetrius O’Shad Leysath, who sports a 4.046 GPA, plays defensive back. Young Mr. Leysath, son of David and Twilla Leysath, lives in the Trenton area of the county. A man of many interests he is currently projecting a career in engineering, sports management or sports medicine. Number 4 will be spending some of his spare time next fall rendering opposing pass offenses powerless. I recognized number 99, “The Foot”, right away. Trent Marks Miller hails from Plum Branch Road where he lives with his father and mother, Dennis and Kathy “Foot” Miller. Rumor has it that the youngster with a 4.911 GPA can kick a football from his house to the County Courthouse and through Senator Thurmond’s legs. With college and graduate school already in his future plans let’s hope this Agriculture Mechanization Scientist, Sorts Doc or Pharmacist comes home. #32, Mr. Harrington Jamal Jackson, will light you up on any Friday night in the fall. The rest of the time he brightens the classrooms and hallways of Strom Thurmond High as he pursues his formal education maintaining a 4.243 GPA. Harrington lives in Johnston with his mom and dad where he tells me he has total responsibility for keeping the house clean since his three siblings graduated ahead of him. I look forward to the sign going up, Harrington Jackson Engineering- A Global Resource. Bertin Estivan Hernandez and I are and were offensive/defensive lineman. His 4.025 GPA is something we do not have in common. Number 57, the son of Bertin and Reinar Hernandez, lives in Johnston and has two siblings. No doubt that International Business Degrees are in his future and he plans to get them at the number one international business school in the nation. So, Junior will be a senior next fall pushing opposing linemen around like rag dolls when not preparing his business plan. Jacob “The Peacekeeper” Keaton Goforth’s career goals could not be more appropriate at any other time than right now. #52 is going to own and operate a construction firm or become a coach. I, for one, would like to see him do both just four minutes from his parent’s house when he finishes his work at whatever university is lucky enough to snag a 5.082 GPA all around good citizen. “Peacekeeper”, by the way, is also the name given to the LGM-118 that carried ten 300kt warheads as well as the revolver that won the west. They packed a punch too. Ryan Heath Thurmond makes you want to put him on a recruiting poster for South Carolina colleges and universities. This young man reads Field and Stream almost everyday and spends lots of time hunting, fishing and playing golf. Yes, college and university recruiting poster representing the good life in the South while maintaining a 3.717 GPA with aspirations to get a degree in Agricultural Mechanization from Clemson University. Ryan’s parent’s, Mike and Susan, are busy trying to keep the big offensive and defensive lineman fed along with his sister Alana down in the Merriwether section of the county. Seventy-six tackles, three interceptions and a 4.036 GPA are some pretty impressive numbers attached to Aaron Montrice Cook and in just a few years another attachment in the form of a title, Dr. Aaron Montrice Cook. I have seen him perform surgery on Friday nights in the fall and feel sure he will be just as proficient as a physician. Montrice lives in the Merriwether section of the county with his parents, Alfred and Eleanor and two brothers Malcolm and Jacob. Of particular interest during my time with the student athletes was the impression they left me with that they too have a lot in common. To the man they spoke of being role models for younger students and their dedication to leadership by example. They shared with me the things they are reading and it was always something pertaining to moral courage and never giving up. Soon I was beginning to see a pattern of honor, courage and duty in these young men that fit Coach Lee Sawyer’s comments to me when he said, “I am proud of what it says about their self discipline and the influence their parents have had on them.” It is evident that these young men, their families, school and association with Rebel Football reflects great honor upon Edgefield County. 2 Responses to "Erudite Rebels"
This was the greatest article I have read relative to students or student-athletes since the ones that area news media published about Travez Bush a few years ago. To my Principal, Mr Reece, you really outdid yourself this time. GREAT STORY, Sir !! And youcan publish this comment if you care to – it’s the absolute truth!! This article is a great representation of today’s student athlete. The dynamic of being an overchieving student and athlete does not always get the well deserve highlight that was printed and written by Mr. Reece. A true tribute to a community, public education system and athletic department that has a tradition of producing well rounded students who will be leaders of this country one day. A true jewel of literature!! !